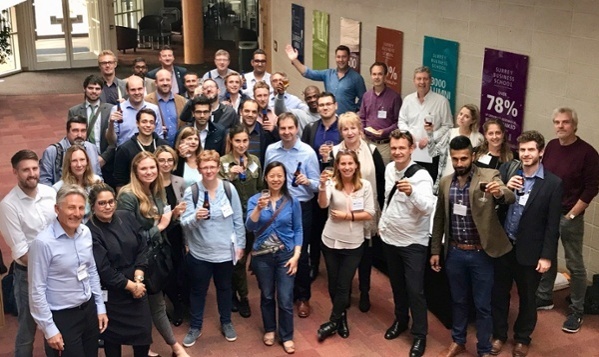 SETsquared Surrey’s Digital Business Acceleration Hubs (DBAH) programme is proving to be an invaluable springboard for entrepreneurs and start-ups, accelerating their path to investment, growth and product launch. SETsquared Surrey’s Head of Incubation, Caroline Fleming, explains why. The Digital Business Acceleration Hubs (DBAH) programme is a major £2.4m business acceleration initiative led by the University of Surrey and 50% funded by the European Regional Development Funding (ERDF) which offers entrepreneurs an unrivalled level of business support to turn their ideas into a reality. Two-day Entrepreneur’s Programme: fast paced, highly interactive SETsquared business support programme. Fully-funded SETsquared Surrey business incubation support (up to 12 months): dedicated business advisor linking you to a network of research centres, investor networks, service providers, mentors and corporations. Why should entrepreneurs/companies take part? To date, 280 companies have taken part in the programme and we’ve seen an incredible range of ideas presented to us in that time. In fact, we’ve never had the same idea presented twice – each idea is so unique you can never second guess how a certain technology might be positioned. I’m always surprised by the sheer number of intelligent consultants out there who are looking to productise what they do. It’s symptomatic of the digital age that we live in and the fact that people can really capture the potential that digital solutions can provide across all industries, from agriculture and retail, to transport, communications and finance; the opportunities are endless. With 20-30 entrepreneurs in attendance at each programme and a business advisor ratio of 1:5, the attendees receive constant feedback and insight from each other as well as seasoned business advisors who have been there themselves and have the collective wisdom of all the companies they have supported. Importantly, the experience of those who participated in the Entrepreneur’s Programmes has also been overwhelmingly positive with everyone agreeing it met their expectations and over 40% of attendees consistently rating the course as “Inspiring”. How do entrepreneurs access the incubation offer? At the end of the two-day Entrepreneur’s Programme, the companies in attendance have an opportunity to pitch their ideas to a business panel made up of myself, investors and seasoned entrepreneurs. We use this as a way of assessing the suitability for further business incubation support, so the incentive to dazzle us with your pitch is there. In order to be selected for the funded incubation we look for companies or individuals where we can really see the growth potential. That’s not to say that all companies don’t have growth potential, it’s just that we’re looking for the ones that could grow a thousand fold, rather than tenfold. With a dedicated business advisor and wide network of providers, companies are continuously signposted to the most appropriate support and opportunities for their stage of development, allowing them to both focus, explore and drive the company forward. Of the participants in the 2016-17 Entrepreneur’s programmes who have been offered incubation, over 150 jobs have been secured and created, 28% have pitched for investment and £6,647,000 funding has been achieved. If you are developing a digital business and are ready to take the next step, read more about our DBAH programme here.